This wide-ranging history synthesizes scholarship and media sources to give the reader an inside view of the television contracts, labor issues, and other off-the-field forces that shaped the National Football League. Historian Richard Crepeau shows how Commissioner Pete Rozelle's steady leadership guided the league's explosive growth during the era ofMonday Night Football and the Super Bowl's transformation into a mid-winter spectacle. Crepeau also delves into the league's masterful exploitation of media from radio to the internet, its ability to get taxpayers to subsidize team stadiums, and its success in delivering an outlet for experiencing vicarious violence to a public uneasy over the changing rules of masculinity. Probing and learned, NFL Football tells an epic American success story peopled by larger-than-life figures and driven by ambition, money, sweat, and dizzying social and technological changes. 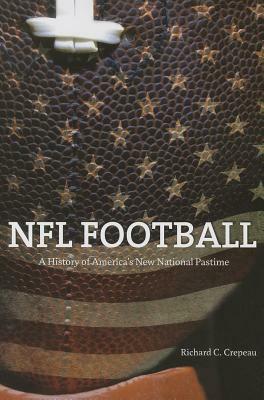 This is a good book about the over view or the new history of the NFL. He really does not spend too much time on any one era and I get that. He starts off with the beginning and with Joe Carr, who was the first commissioner of pro football. He was also an owner, and really more than what was given in this book. He was the one that wanted rules and reefs, came up with fines on teams and players and also owners. He did a lot and the only part or the book I really did not agree with was that he made him out like he always went to George Halas to make a decision and that was not the case. He was a very strong man and he made the tough decisions and he made the league and knew that the league needed to move into larger cities, New York, was really the place that he wanted to move the league to a get a team to find a strong owner group. Which he did. Anyway, the rest of the book takes you through 50s, the 60s and the AFL, which really could be a book all by itself, which also includes the beginning feud with Al Davis and Roselle. Then the 70s with the beginning of the rule changes to open up the scoring. He also has a chapter on how big the Super Bowl has gotten and another one on just the NFL in general with the NFL network and the NFL in general. He does speak of some of the people like Lombardi and how the Packers have made it. I also liked the chapter about Paul Brown, people either forget all he did or just don’t know, but a lot of what he started doing in the 50s with the Browns are still being done today in the NFL just in a bigger scale. Overall this is a good book, I will say I am not the average fan, I have been reading and following the NFL since I was a kid since the 60s, reading everything I could get my hands on, and I will say this is a pretty through book especially showing the growth of the league itself. A good read. I got this book from net galley.